The habitat is an important concept in biology and microbiology in particular because microorganisms are greatly affected by where they live. Microbial habitats — including soils, rivers, lakes, oceans, on the surface of living and dead things, inside other organisms, on man-made structures, and everything in between — provide nutrients and protect cells from harsh conditions. The more places you look for microbes, the more microbes you find. Every environment is stratified (arranged in layers) in terms of the degree of temperature, oxygen, nutrients, and sunlight present. These stratifications make up different niches to which a specific microorganism, or group of microorganisms, is uniquely suited. Over the billions of years that microorganisms have been on earth, they’ve evolved to fit perfectly almost every niche. They really are everywhere. Many habitats on earth have extreme temperatures, pH, salinity, and/or acidity and, because of this, they’re inhospitable to most animals and plants. Instead of being devoid of life, these environments are rich in microbial life. Microbes live at the depths of the ocean and in the highest clouds. They thrive at extremely high temperatures, near hydrothermal vents, and at extremely low temperatures inside polar sea ice. Microorganisms can be found at extremes of pH, salt, and dryness, but they’re also very abundant and ubiquitous at all conditions in between. In addition, some microorganisms are resistant to substances toxic to most life — the microorganisms often use these substances for energy and, in the process, detoxify them. Everywhere you look, you find microbes, even in places that you may not expect: surgical suites, NASA clean rooms (specially designed rooms with special air handling and disinfection so that they’re free of any microbes), the human brain, and subterranean caves. For every system that has been designed to keep out microbes, there is a microbe that has circumvented it. This is because microorganisms are the masters of adaptation and because there are so many different microbes adapted to so many different conditions. What this means is that despite our best efforts, microbes can sometime be very difficult to get rid of. The number of microbial cells is not the same in each habitat. Some locations host a large number of bacterial cells, called a biomass, whereas others have a large number of different bacterial species or groups. For instance, the colons of animals are home to maybe the largest biomass of bacterial cells anywhere, with estimates of 1010 cells per gram. However, the number of different bacterial groups are thought to be in the range of 100 or 200. In contrast the most diverse habitat, containing the largest number of bacterial species, is probably soil, with somewhere around half a million species in a gram of soil. Environments with mixed nutrient sources often have high microbial diversity because many different microbes can grow without one taking over completely. So, the total number of microbes is lower, but the number of different species is higher. In some cases, microorganisms have made their own habitats and grow in large multispecies communities that are obvious to the naked eye. An obvious example of this are microbial mats, which can include many different species of bacteria and archaea. Another, slightly different type of microbial community, called a consortium, involves a more intimate relationship between a small number of different microbial species. 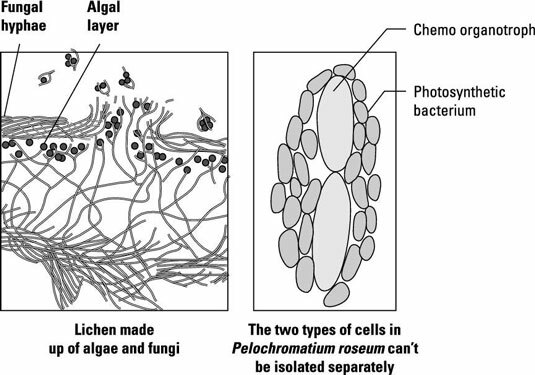 Two examples of this are lichen and the green sulfur bacterial consortium of marine and freshwater environments.